Swiss Shield fabrics hold Oeko-Tex 100 Class 1 Certification, meaning they are so safe you could, if you so wished, make babies underwear from them. Yarn: Polyester fibre with gossamer thin 0.02mm silvered and PU (polyurethane) coated spun in copper thread. 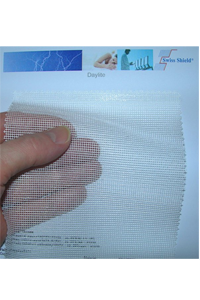 Type: Knit fabric - decorative textile. 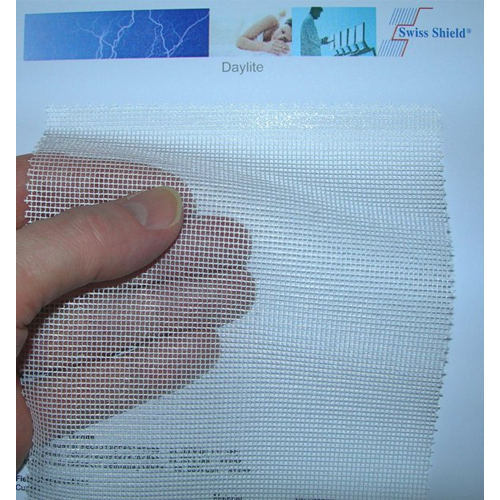 Description: A high quality, translucent lightweight fabric with all the characteristics of non-EMF shielding textiles. Uses: Curtains, room dividers, canopies etc. Click here to view a Test Report of this amazing fabric.